Since ancient times, menstruation, a normal physiological process in a woman’s body, has been surrounded by several legends and myths. These taboos, based on religious beliefs and lack of information, portray women’s period as something impure, dirty and shameful. In developing countries, these prejudices still have severe implications for the lives of more than a billion girls and women. In Breaking Menstrual Taboos, German journalist Dirk Gilson brings the issue to discussion through a multimedia project consisting of two documentaries, three radio features and a web documentary. Based on his explorations in India, Kenya and Nepal, he tells the story of women for whom menstruation is a monthly struggle. While in Nepal women are banished from their houses during menstruation and in Kenyan slums girls miss out on schools because of lack of sanitary pads, in India a man found a solution that helps millions of women to have a better period experience. This last story about India's Menstruation Man went viral and became Al Jazeera’s most watched video on Facebook of all times. In an interview with the European Journalism Centre, Dirk talked about his experience of reporting about a sensitive issue and the process of developing a multimedia project. You have approached menstrual taboos through three stories from three different countries, Nepal, India and Kenya. Considering that it is a problem which affects girls and women in several developing countries, what makes these three cases a good sample? I think it is the variety that makes them a good sample. On the one hand, my goal was to show different implications caused by a lack of access to menstrual hygiene products. On the other hand, I wanted to highlight possible ways to improve the situation and to break the taboos. Although the three stories are all based on the same issue, they show different aspects of it. 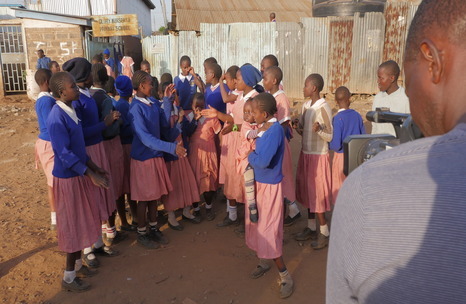 In Kenya, there is the story of the school girls who suffer because they cannot afford sanitary pads. Some of them prostitute themselves in order to be able to buy sanitary pads, but they break local taboos by openly speaking about it. In India, we interviewed the Indian inventor who was considered a pervert and now is a star in his country because of his affordable sanitation pad-machines. And then in Nepal I told the story of women who are considered impure and untouchable during menstruation based on ancient traditions. Your project highlights that taboos surrounding menstruation stem from a lack of information. What is being done in these three countries to raise awareness for this matter? Non governmental organisations (NGOs) and governments alike have been implementing a variety of projects aimed at raising awareness about this issue, but there is still a long way to go. One important thing, in my opinion, was setting up a Menstrual Hygiene Day and NGOs from all over the world joined forces to highlight the challenges girls and women face because of menstruation. This has helped boost the media coverage and to bring this issue to the forefront of the discussions. Another important thing would be to include issues related to menstruation and hygiene as part of every school curriculum, which is slowly happening. How did you, as a man, manage to get girls and women to talk to you openly about this sensitive topic? This was of course my biggest concern in the beginning. I contacted some people from NGOs who work in this field and asked them how the girls and women would feel with me, as a man, coming over to make documentaries about menstruation. I also wondered if they would be open to talk to me about their own experiences. To my surprise, they said that despite it being a highly sensitive issue, girls and women would be happy to speak about it if they understood it would help to raise awareness about the situation. Of course, I think it would definitely not have worked without the help of the people from the NGOs I worked with. For example, there was always a lady from the organisation present with me that would explain to them in advance what the purpose of the visit was. What I also did was to visit them more than once. I would first go without the camera, just to say hello and to introduce myself. In the end, I was astonished by how openly the girls in Kibera talked to me about their personal experiences. Another very amazing experience was to shoot the cleaning ritual in Nepal. I would never have imagined that I would be allowed to witness that. You have worked with a small team in this project. Was it difficult to handle different tasks? 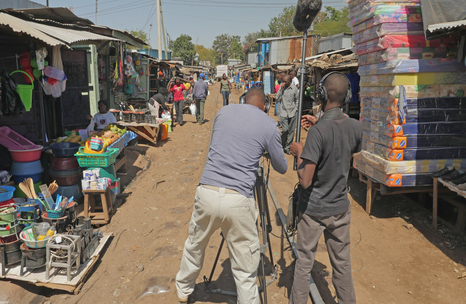 In Kenya, I got support from the WDR Studio and I worked together with a cameraman and a sound recordist. In India, I was with a friend of mine, Henryk Ditze, who is a cinematographer, and in Nepal I was alone. On the one hand, it is difficult to work in a small team or alone. On the other hand, it can be an advantage because it is often easier to approach people if you are alone rather than if you show up in a big group. For instance, I really doubt that I would have been allowed to witness the cleaning ritual in Nepal if I had appeared there with a team of three or more people. This has always two sides. What were the main challenges you came across during your travels? Large distances and places difficult to reach were a challenge. Time was often limited too, which is the case in almost every big project. For example, I did not want to disturb girls’ education time in Kibera too much, so I tried to adapt my work to the school schedule as much as possible. Besides, girls and women in Nepal were always pretty busy. They had to collect wood, collect grass three times a day, as well as walk long ways to the water tap because they were not allowed to use the one in the village during their menstruation. Of course a film team always disturbs the daily routine, after ten minutes the whole village knew that something was going on. I still however tried to adapt my work to their schedules. I think this is important in order to reach a more authentic outcome. Why did you choose to tell this story through a mix of formats - TV documentaries, radio features and a web documentary? I thought that by using a mix of formats I can reach a bigger audience. With the web documentary I can reach an online audience who likes to interact with a story, while with TV and radio I can still engage a big public that uses TV and radio as their main source of information. Distributing the work via TV, radio and internet works to maximise the impact of the project. By far we reached the biggest impact with the English version of India's Menstruation Man. It went viral and now has more than 18 Million views on Al Jazeera's Facebook page. I can't tell exactly why it went viral but some important ingredients come together: an unusual story with an impressive main character. Mr. Muruganantham broke a taboo in his country and the documentary also breaks a taboo by telling his story. From a more technical perspective what is really important for documentaries on Facebook is the opening (the first 2-3 seconds): it has to be eye-catching, otherwise people just scroll further. So we edited the TV version to make it fit better to the web. It's two minutes shorter and it uses inserts instead of narration, so it can be even watched without sound. The German versions of my documentaries from India and Kenya, broadcasted by WDR's science and education program Quarks & Co. , reached around one million people via TV. Triggered by my pitch, Quarks & Co. decided to run a whole program (45 min) on the topic of menstruation, for the first time in 20 years. What have you learned from making a web doc in comparison to a TV documentary? I did many TV documentaries before, but this was my first big web documentary project, so of course it was challenging. At the same time, I discovered that the web doc format provides very interesting possibilities for journalists. For instance, there are situations where a photo is much more powerful than a video. If I had done a normal TV documentary, I would have been forced to use only videos. With the web doc, I could choose from an array of options the one that fits best to each situation. Another big advantage is that there is more interaction with the audience/the user. It's their decision for how long they stay on a page and how often they watch a video. That is what makes a web documentary a powerful and engaging way of storytelling. The project was published on WDR, 3sat, Arte and Al Jazeera. How have you approached these media outlets? Was it difficult to sell the story? It is always a bit difficult to work in big projects with media outlets. For sure, I would not be able to develop the Breaking Menstrual Taboos project without a grant. Although the media partners liked the story from the beginning, a project like this involves a considerable period of time, travels to different countries, money and effort. So once I told them that they would not have to bear the expenses of my travels and so on, they were much more open. An editor also said it was a rather unusual topic and did not know whether their audience would be interested in it. But overall the main concern of media companies regards funding and that is why it was so important and fantastic for me to get the grant. Have you faced any complications when adapting the pieces to each media outlet? The most complicated part was to publish the English version of the web documentary with another media partner. I used the tool Pageflow to make the web doc for WDR because they usually run their web stories with Pageflow. Since it is open-source I thought that it would be easy for other outlets to also use Pageflow to run my web doc. But I found out that most of them did not have the infrastructure to run this kind of project. In the end I was lucky that Al Jazeera had the experience, the resources and was willing to take the effort to install Pageflow on their server. The whole process of contacting different English-language media outlets to the publication in Al Jazeera took about three months. I learned a lot during this process! I received a lot of positive feedbacks on Facebook, Twitter and through the broadcasters. Many people said they have never heard about this problem before and that they were happy that western media was reporting about this kind of topic. Others also asked how they could help the girls in Kibera or what they could do to support the work of the NGOs. The documentary India’s Menstruation Man reached a huge audience, I think it has already more than 18 million views. Thousands of people discussed about it on Facebook, which is fantastic. The impact was far beyond my expectations. What is the next step for Breaking Menstrual Taboos? And for the journalist Dirk Gilson? I'm working on a 30-minute version of my documentary on India's Menstruation Man. 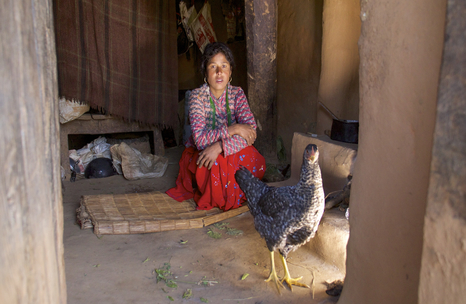 Additionally, I would like to translate the web documentary from Nepal to Nepali, the local language. There will also be a third radio feature, also from Nepal, coming out at the end of April. Furthermore, the documentary from Kenya will be screened in the school in Kibera, which is great I think. The girls hopefully will be proud to see themselves in the documentary. For me personally, I visited Nepal again to report about the situation one year after the earthquakes and I have some new stories I am working on at the moment. Some of them are here in Germany, but I am also working on another development journalism story that is in the concept phase at the moment.